The Philippines again proved worthy adversaries at the Asian Cup but despite their best efforts were ultimately beaten 3-0 by China. 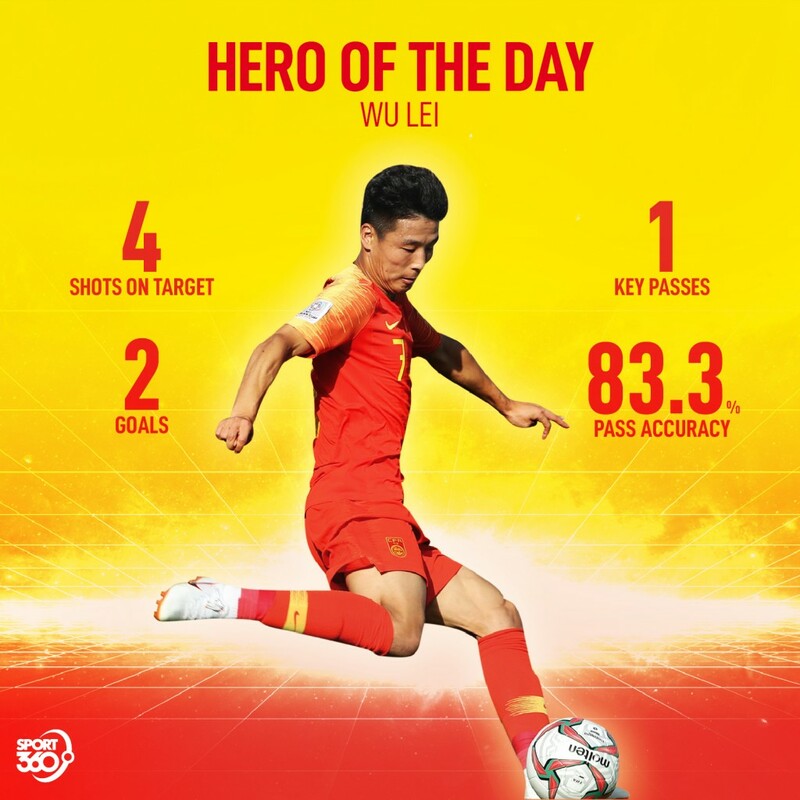 While the Chinese were not at their best, they were aided by sheer individual quality, much of which was provided by Wu Lei. The striker scored a spectacular brace before Yu Dabao added a third 10 minutes from time. Wu Lei started in a front three flanked by Wu Xi and Gao Lin but saw little of the ball in the attacking third during the early exchanges. The Philippines were up for the fight and much of the battle was carried out in the heart of midfield but Lei forced himself into the picture by showing for the ball more sparking the encounter with a sublime opener. Receiving the ball on the edge of the box, he turned and curled his exquisite effort into the far top corner. He was more involved in the second period, setting up Zhao Xuri for a big chance early in the half before forcing the keeper into a save himself soon after. Lei nearly broke the offside trap on a couple of occasions but then outdid his first goal with a sumptuous volley from a corner in the 66th minute. With little over 10 minutes to play, he could’ve completed his hat-trick but for an excellent save from Michael Falkesgaard in goal. It’s easy to pick out his two sensational finishes but what’s just as impressive is the way Lei took the game by the scruff of its neck. He showed excellent awareness to drop deep to get involved in the game. He peeled off the defenders expertly for his first goal, dropping into a pocket of space on the edge of the box before his gifted right peg did the rest. His positioning for his second goal was no coincidence either, giving his marker the slip before thumping his effort home. Lei also tried to stretch the defence with his runs in behind as the opposition began to chase the game. Finally, a glorious opportunity to get his third came from his decision to drop deep again, play the ball wide and then make a late run into the box for the return. If there’s one criticism from this performance it would have to be a degree of carelessness he showed in possession. Lei struggled with his hold-up play and coupled with a few stray passes, he lost the ball 12 times. In his defence, that’s still fewer than his fellow forwards Lin (17) and Xi (13). 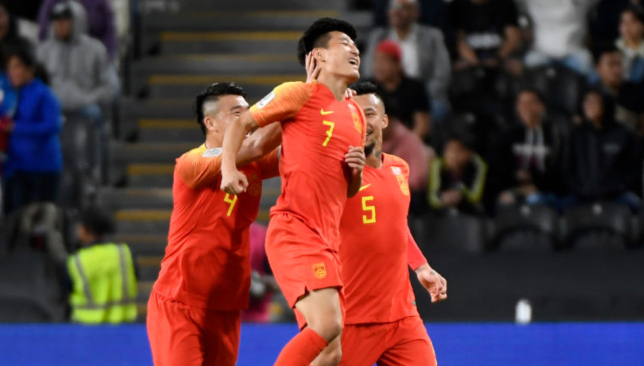 For much of the game it seemed as if the Philippines may get something out of this game but then Wu Lei decided to burst into life. With his seventh and eighth goals for his country, the 27-year-old proved to be the catalyst for a vital 3-0 win that took them to the top of Group C.
Both of his strikes will no doubt enter the running for goal of the tournament. Asian Cup champions Australia will head into Tuesday’s Group B-decider against fallen dark horses Syria “expecting to win” after they rebounded from a shock opening loss to down Palestine, according to head coach Graham Arnold. 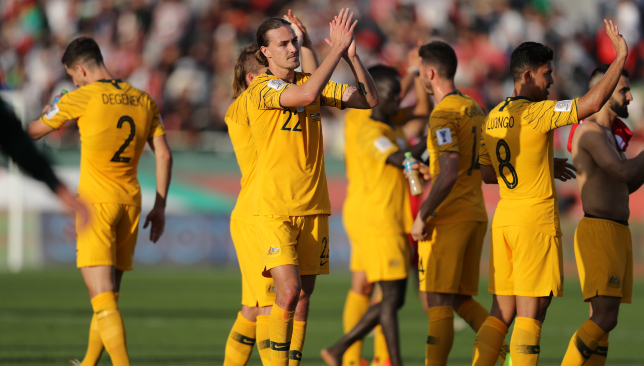 The Socceroos fell to a 1-0 defeat to Jordan last Sunday when the 55-year-old’s first competitive match of his second stint in charge got off to an alarming stint. Doubts were cast aside, however, at a sold-out Rashid Stadium on Friday through unanswered goals – all via crosses – from Jamie Maclaren, Awer Mabil and Apostolo Giannou. “Palestine pretty much tried to play the same game plan as Jordan did,” said Arnold, whose side wrap up their pool commitments at Al Ain’s Khalifa bin Zayed Stadium against a nation they defeated during October’s 2017’s World Cup play-offs. “We obviously haven’t been that long together – the players didn’t have a long camp like some of the other countries, so it’s taken a bit of time to get things going. “But as I said after the Jordan game, when you lose you learn. And we learned a lot from that day. “We went onto the training pitch, we worked hard to fix that issue if the teams play quite defensive. “Now it’s all about the Syria game. We’ll get back on the training field, and recover well. “We’ll go into the Syria game with all guns blazing and expecting to win. Familiar faces will greet the Socceroos in midweek. A nervy 3-2 aggregate win was claimed under predecessor Ange Postecoglou, from which early elimination was avoided when star Syria striker Omar Al Somah’s late free-kick in extra time rattled the post. Easy as you like for #GoSocceroos at sell-out Rashid Stadium. First international goal for Maclaren is main takeaway from 3-0 Palestine win, plus injection of energy from three new starters. Ban for Sainsbury is only worry. The Syrians, however, have gained only one point in the UAE and sacked manager Bernd Stange after Thursday’s 2-0 defeat to Jordan put them on the cusp of elimination. “This will be a difficult game,” insisted Arnold. “We know them well; we played against Syria in the World Cup qualifier. Australia got their Asian Cup defence back on track with a comfortable 3-0 win against Palestine at a sell-out Rashid Stadium. Two goals in three first-half minutes lifted the gloom cast by Sunday’s shock opening 1-0 defeat to Jordan in Group B. On-loan Hibernian striker Jamie Maclaren broke his international duck to flick in Tom Rogic’s cross in the 18th minute, before Midtjylland winger Awer Mabil volleyed home shortly after. Despite the vocal encouragement of the sizeable Palestine support, a response could then not be stirred in their outclassed heroes. A third goal would follow in the 90th minute when replacement Apostolos Giannou headed in from point-blank range after a short corner, Chris Ikonomidis getting a second assist. Mahmoud’s might – It takes a good player to unsettle the Socceroos’ centre-back axis of Trent Sainsbury – now suspended for Tuesday’s critical decider against Syria after a second competition booking – and Milos Degenek. Palestine only had three attempts in the entire game, with none on target. But when they chipped it up to hulking Al Masry centre forward Mahmoud Wadi, confusion abounded. Wadi was a second-half substitute in the goalless draw with Syria. His mere presence should mean the Australia promotion remains for the decider with Jordan. Although the fact Palestine have gone scoreless in both games does not auger well for a first knockout-stage progression. Socceroos strike back – Australia’s setback against Jordan did more than just provide a false start. It lead to questions about the entire Graham Arnold programme. Plus, left the likes of Iran, Saudi Arabia, Japan and South Korea in early positions of strength. At a partisan Rashid, the Sydney FC legend’s new charges came up with the right answers. Ikonomidis and Mabil were excellent on both wings. Tom Rogic, Jackson Irvine and Mark Milligan should be good enough to win most midfield battles, while Maclaren’s excellent header eases so much pressure. Ultimately, this Soceroos’ set-up misses a goal scorer the most now that Tim Cahill is – finally – retired. Maclaren must keep this up. A fluffed third-minute mishit showed the rushed side of the Darmstadt 98-owned striker’s game. Defensive disasters – Palestine looked a tough nut to crack when they opened with a 0-0 draw with Syria. The likes of skipper Abdelatif Bahdari simply relished the aerial fight with the direct Syrians. Without suspended usual foil Mohammed Saleh, however, Palestine’s resolve crumbled. Australia profited from a trio of crosses. Maclaren and Giannou’s goals looked particularly bad on the replay. They cannot be so lax against qualified Jordan and expect to proceed. Sainsbury’s suspension – It appeared a nothing moment. But the 83rd-minute yellow card shown to premier centre-back Sainsbury as a comfortable win wound to a finish could have stark consequences. A pair of bookings mean the PSV Eindhoven defender will not be present to repel Syria’s 2017 AFC Player of the Year Omar Khrbin and Al Ahli Jeddah talisman Omar Al Somah on Tuesday at Khalifa bin Zayed Stadium. Matthew Jurman is the likely stand-in. His struggles at shock Saudi Professional League relegation candidates Al Ittihad, however, show he is not a like-for-like replacement. 3rd min CHANCE: Maclaren receives the ball unmarked in the penalty box, but pulls off an embarrassing air-shot. 18th min GOAL: Rogic swings one in from deep and Maclaren moves between the centre-backs to expertly flick a header home. Memorable way to score a first international goal. 20th min GOAL: The Socceroos go wide again. This time, Ikonomidis floats a centre in and Mabil arrives unmarked at the back stick to emphatically volley in. 54th min WOODWORK: Right-back Rhyan Grant’s cross/shot rocks the crossbar. 90th min GOAL: Giannou strolls in unmarked to head home Ikonomidis’ well-worked short corner. Change had to be afoot for Australia after a listless opening loss to Jordan. Under-pressure boss Arnold restricted the changes to three – and all of them impressed at Rashid Stadium. Mulleted right-back Rhyan Grant dominated his flank and rocked the crossbar in the second half with a deflected cross/shot. Hull City midfielder Jackson Irvine added drive to the centre of the pitch in place of sedate fellow Championship performer Massimo Luongo, plus Chris Ikonomidis strong early form with Perth Glory translated into an assist for fellow winger Mabil and substitute Giannou. The constant between this trio is energy. Life has been breathed back into the Socceroos. Not even the partisan support packed into the Rashid could lift limited Palestine past their opponents. They have it all to do against Jordan to get a result that sends them into the knockouts when Group B winds up on Tuesday. This result was a victory for Arnold. His changes all paid off, plus you could discern a new direction that the Socceroos are going to travel on. Syria will be tough final opponents. But they showed enough this weekend to feel confident of another triumph against the nation they defeated in World Cup 2018’s play-offs.